After being chatted up by a few Champagnes at a tasting, it was good to have a real conversation with Waris-Larmandier Sensation NV. The better grower Champagnes do not waste words; they have something they need and want to say. In this case, poised and radiant, it was also the way it said it. The 10% of Pinot Blanc (only possible because the vines are older than the Champagne Appellation laws that now allow only Chardonnay, Pinot Noir and Pinot Meunier) gave it a freshness and lift reminiscent of the best Italian Franciacorta. Now run by a widow and her children, a strangely common trope in Champagne, Marie-Hélène Larmandier is a 5th generation grower from the Côte des Blancs who is also an accomplished ceramicist. There are regulation cursive writing and plainer label Champagnes, this one is smooth and colourful as a clay bowl after fired in the kiln. A beautiful Champagne with an artist’s heart: deep but light, smelling of red apple and spicy lemongrass, an expansive feeling of unexpected luck, like walking home from a party in a grey dawn and finding a bejewelled Venetian mask on the cold concrete. Thanks to Champagne + Fromage 22 Wellington Street, WC2 for the tasting. A home for Grower Champagne (and cheese) fanatics. I bought a few bottles to take home. 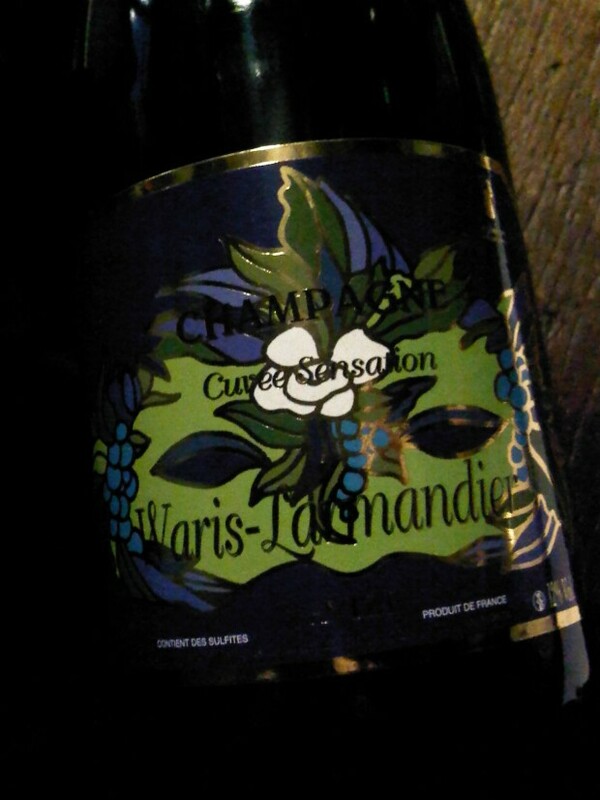 Champagne Waris-Larmandier NV £29 RRP 60% Chardonnay, 30% Pinot Noir, 10% Pinot Blanc and Meunier. “@winewomansong: Latest (and belated) post on wws – beautiful grower champagne from @frenchbubbles http://t.co/CNZedarV” fantastic review! !